If my 4th child had a super power it would be the power of snuggle. He was born ready and willing to cuddle. Any time. Any place. It doesn't hurt that he is probably one of the sweetest kids you'll ever meet and his eyelashes are oh-so-long and mesmerizing. He was the type of baby and toddler who was happiest sitting right next to you... all the time. I do really mean all the time. While endearing, it was also occasionally (dare I say?) a little bit annoying. I'd be cooking dinner and he'd need a hug. I'd be reading a book to his sibling, and he needed to sit between me and the book, preventing me from seeing the page. He didn't want to watch a movie without a snuggle buddy. Ever. There were perks, too. Like the mornings (-actually every morning-) when he'd crawl into bed with me, pull the covers up to his chin and burrow in for a few cuddly minutes before starting his day. Every day after school I'd look forward to almost getting knocked over when he'd be so excited to see me that he'd run into my arms at full speed. But, as was bound to happen, he started growing up. He doesn't charge me after school any more and other than asking me "How soon is dinner?" he mostly leaves me alone in the kitchen. At least he still likes to cuddle during movie night. Eventually our wake-up morning routine disappeared too. I knew this day would come, he has 3 older siblings and I've seen it before. As their world gets bigger and more interesting Mom becomes less and less the focus. But with this particular kid, the absence of such extreme affection was particuarly noticeable. Some days I kind of miss the younger version of my little guy- the one who was always ready for a hug. This last year, I've noticed a strange phenomenon. To fully understand, you need to know that my son loves birds, particularly ducks. He has several yellow stuffed animal ducks that he is very protective of. If he even lets you hold one of them you should consider yourself a trusted friend. But these ducks keep crossing my path. Some mornings I wake up to find that he has tucked one of his beloved ducks in next to me during the night. When I'm reading a book, he sometimes plops one into my lap. (Of course placed in such a way that I can't see the page.) When I sit down to dinner, there might be one sitting on my chair. When I'm sick he brings me a duck. When I'm having a bad day the duck appears. When I went on a trip last year, he tried to pack one in my suitcase. They're everywhere and they've become a familiar reminder that I'm still very much loved by my not-so-little little boy. 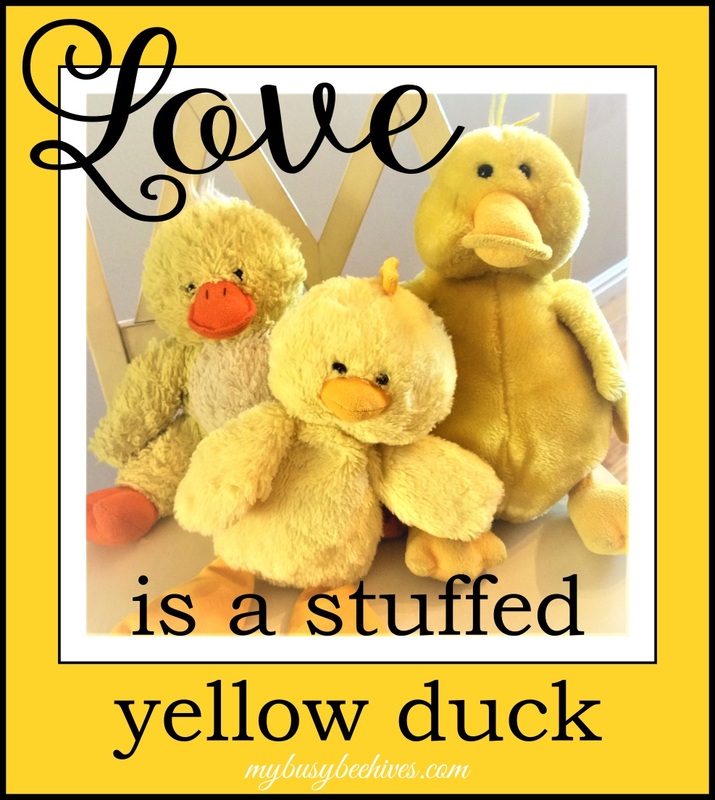 So sometimes, Stuffed Yellow Ducks = "I love you, Mom." I may need to buy him some more ducks.